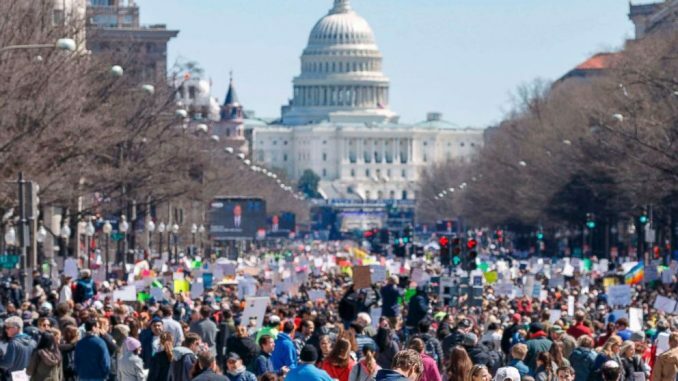 On this day, even as I write this editorial, hundreds of thousands of protesters have made support of the NRA, the bought politicians, and gun enthusiasts not only distasteful but reprehensible. In a state that is overwhelmingly conservative, discussion of gun control is generally greeted with venom and close-mindedness. However, regardless of partisan perspectives, it is always worth reflecting on the quality of our national values and it is always worth working to improve them. It is not a political question but a moral question. The fantasy that gun supporters will free the country of a hypothetical, tyrannical government by the sanctification of an outdated constitutional prophecy does not outweigh the reality of murdered children. It is not about the foolish countermeasures proposed by our fellow conservative citizens: “the only way to stop a bad guy with a gun is a good guy with a gun,” it is not about armed educators and armored schools; it is about the kind of society we want to create and live in, it is about our values as a nation, and it is about the standard we hold ourselves to. Today, this generation has spoken. It should not be a divisive demand, it should not be partisan; the issue of gun control is as much a human rights issue as any other. While the Bill of Rights established our “right to bear arms,” the Declaration of Independence more broadly and more profoundly established our right to life and happiness. If we are subject to a government of such rigidity that we cannot discard outdated doctrine, if we cannot change the obsolete principles in the fabric of our constitution, then I say that we have sacrificed the irrefutable importance of our freedoms for the tyranny of mindless tradition. We are, then, not free, but held captive by a “right” that now precipitates death and engenders fear more than it serves individual protection. A “right” that once symbolized freedom now robs it. The Bill of Rights is not (or should not be) beyond criticism, especially when it no longer supports the needs and the demands of the people. I take this opportunity to remind my fellow Americans that the Bill of Rights was written 230 years ago by a group of men who, while their contributions to the foundation of our nation were great, did not truly believe in the public’s ability to govern themselves and that the Constitution was approved by aristocratic delegates, not by public opinion. Now, 230 years later, that notion has changed and public opinion is changing. We are not a country of bloodshed, we are not a generation of complacency, and we will no longer endure the quiescence of a silent and complicit Congress.